Wash and cut okra in halves. Heat oil in a wok or kadai. Add cumin seeds and let it splutter. Add chopped onions and ginger garlic paste. Fry till golden brown. Now add cut okra with rest off the spices and stir well. Cook it on medium flame and keep stirring it occasionally so it does not stick at bottom. Add the tamarind water . 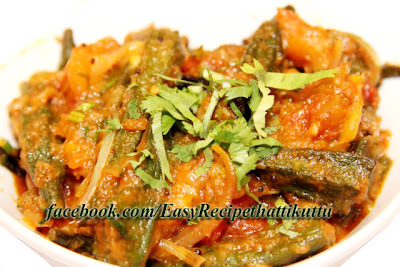 Keep frying till okra are fully cooked. Serve Okra Roast hot with chapathis.